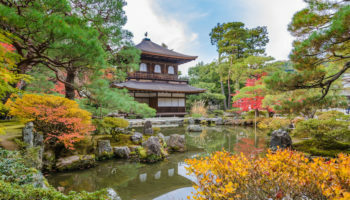 Kyoto, which was once the capital of Japan, is known for its many beautiful temples, shrines and also for its many historic sites, including Nijo Castle. 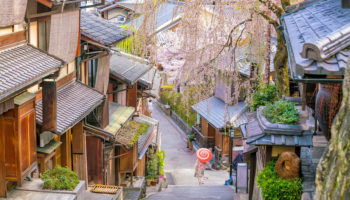 This city is, in fact, one of the best places to catch a glimpse of “Old Japan.” For the full historic effect, you might even want to consider staying in an old-fashioned ryokan or riding in a rickshaw through a stunning bamboo forest. One of the most popular destinations in Kyoto is the Gion district where you’ll find a large concentration of traditional wooden merchant houses. It is also where you might see geisha or maiko (apprentices) walking through the streets. 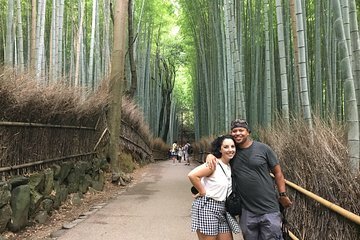 Then once you’re done exploring this lovely city, consider checking out the following sites that are all within an easy day trip from Kyoto. This city is home to Hikone Castle, which is one of only 12 original castles in the entire country. Completed in 1622, Hikone Castle served as the seat of the feudal lords until 1868. Today, it has been designated as a National Treasure. Hikone’s number two attraction is the garden at the foot of the castle. The park contains a sprawling villa built in the Chinese Tang Dynasty style in 1677 for Naooki Ii, lord of Hikone. The city, which boasts that it has retained the look and feel of the Edo period, is located on Lake Biwa, which is the largest lake in Japan. During the summer, this lake is a perfect escape if you’re into fishing, swimming or kayaking. You’ll also find several interesting temples and shrines in Hikone, including the small Shingon-shu Daishiji Temple. Lying just to the northeast of Kyoto, Hikone is only an hour away by train on the JR Tokaido-Sanyo Line. If you’re really in a hurry, you can always shave twenty minutes off of your journey and take the Shinkansen bullet train to Maibara Station just north of Hikone. From there, you then take a short five-minute train ride to Hikone Station. All in all, this should take around 40 minutes. 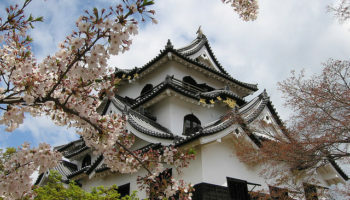 Once you’ve arrived, the majestic Hikone Castle is just a stone’s throw away. As Tokyo’s third largest city, Osaka offers visitors a slew of modern as well as historic attractions. It is home to beautiful Osaka Castle, which dates back to 1583, and is one of Japan’s most famous landmarks. Looking for thrills and chills? No problem. In Osaka, you can hit Universal Studios Japan, which features The Wizarding World of Harry Potter. Not into theme parks? No problem. Osaka is also home to the Tennoji Zoo and the Osaka Aquarium Kaiyukan, which is one of the largest aquariums in the world and even has a whale shark on display. There are also a large number of museums in Osaka, including the National Museum of Art and the Osaka Museum of History. Night life lovers won’t want to miss visiting Dotonburi. This district, which pulsates with both neon signs and energy at night, is where you’ll find great shopping, dining and drinking. As Osaka is such a vast city, the transport option you choose in Kyoto really depends on where you want to end up when you get there. If you’re heading to Osaka Station, for instance, then you can always take the JR Kyoto Line, which will get you there in around 25 minutes. Another option from Kyoto Station is to take the bullet train to Shin-Osaka Station, which remarkably traverses the 50 kilometers to Osaka in just 12 minutes. While this is the fastest option, it is also the most expensive at around 1400 Yen. Although it is probably best known for the famous beef that comes from the cows raised in this area, Kobe is also a lovely port city. Located approximately 65 km (40 miles) from Kyoto, this city boasts numerous shrines and temples, including Ikuta, a beautiful and peaceful Shinto shrine that was founded in 201 AD. Want to feast on authentic Chinese dumplings and noodles? Then head over to Kobe’s Chinatown where you can enjoy great Chinese food and shop for interesting souvenirs from China. Meriken Park, which is located on the waterfront, is another popular spot for strolling. Of course, you’ll also want to try the famous Kobe beef at one of the many restaurants that serve this specialty meat. There are even places where you can try Kobe sushi, which feature raw slices of the beef over rice. While it takes only half an hour to reach Kobe by shinkansen from Kyoto, this only takes you to the Shin-Kobe Station, so you’ll have to take a short bus or train journey into the center of the city. This should, however, only take you another 15-20 minutes. Another option is to take the Special Rapid train to Sannomiya Station, which is in the heart of Kyoto. This costs around 1000 Yen and should take just under an hour. You also avoid the hassle of having to change public transports. This beautiful scenic island is best known for its famous torii gate, which seems to be floating on water during high tides. Miyajima is also supposedly the island where God lives, so — not surprisingly — it is home to numerous shrines and temples. After checking out the beautiful torii gate and the many shrines, head to Omotesando, the main street on the island, where you can try the local fare or pick up some interesting souvenirs. There are also places to hike around the island. Interested in a spectacular view of the island and surrounding sea? Then you’ll definitely want to take a ride on the Miyajima Ropeway, which will zip you up to the top of Mt. Misen. When visiting the wonderful Miyajima from Kyoto, many people decide to take a guided tour. This not only transports you to the island, but also takes you around the moving Hiroshima Peace Memorial Park and the haunting ruins of Genbaku Dome. Consequently, a tour is an efficient and informative way to see as much of Miyajima and Hiroshima as possible in just one day. See trip reviews & prices. This is one of Japan’s 12 original castles and also, arguably, its most famous. It is also one of the country’s most imposing and spectacular castles. 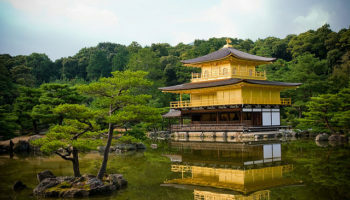 And unlike many of the other historic landmarks in Japan, it has never been destroyed by war, earthquake or by any other disaster — natural or manmade. So a visit to Himeji Castle is an excellent peek into Japan’s past. This castle, which was founded in 1333, sits atop a hill overlooking Himeji City. To reach the castle, visitors must climb up steps that get progressively smaller as you near the top. This was for defensive purposes, so that attackers could not rush the castle. Himeji Castle is also sometimes referred to the White Egret Castle or White Heron Castle because it is said that the stunning white structure resembles a big white bird in flight. From Kyoto to Himeji, it only takes between 45 minutes to an hour by Shinkansen and will set you back around 5,000 Yen. A cheaper option that works out at around half the price is to take the Special Rapid Service to Himeji Station instead. However, this takes about an hour and a half and is a lot more crowded in comparison. From the station, it is only a 15-minute walk to the city’s main attraction – its spectacular castle. Hiroshima and Nagasaki were the two cities upon which the United States dropped atom bombs in August 1945. The bomb leveled Hiroshima, and it took many years to rebuild. But today Hiroshima is a vibrant, growing city known for being a haven for foodies. But even as Hiroshima looks forward, it has definitely not forgotten its tragic past. There are many memorials to honor the victims of the devastating bombing, including the Peace Memorial Park and Museum, which is home to the Atomic Bomb Genbaku Dome, and the Children’s Peace Monument. You can also learn about Hiroshima’s pre-atomic-bomb history by visiting Hiroshima Castle. While the original structure was destroyed by the atomic bomb, it has been rebuilt and is now a museum dedicated to the Pre-World War II history of the area. 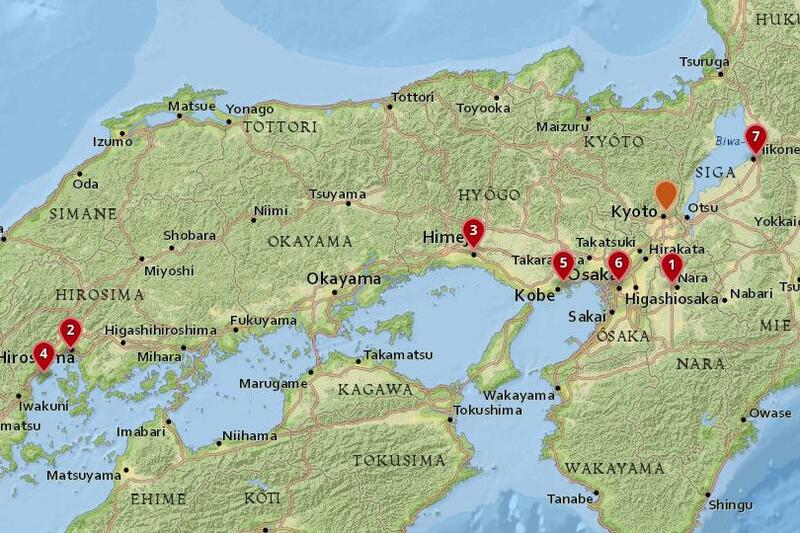 Though Hiroshima is located quite far from Kyoto it takes just over two hours by bullet train to get there. 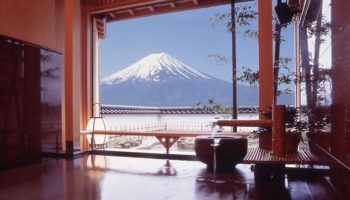 Despite being located over 350 kilometers from Kyoto, it can take as little as an hour and forty minutes to travel from one city to the other if you take the shinkansen – or high-speed bullet train. 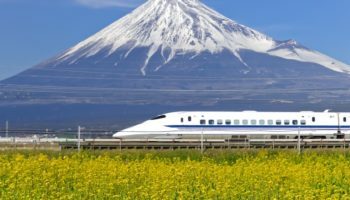 You can buy a ticket for the shinkansen at Kyoto Station for around 10,000 Yen; both the Tokaido and Sanyo lines will take you directly to Hiroshima. From Hiroshima Station, it is then only a short bus or streetcar journey to most of the main sights. 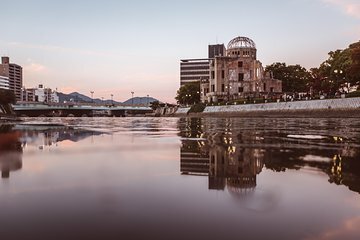 Although it is relatively straightforward and quick to get to Hiroshima by train, many people choose to visit the city with a guided tour, as this enables you to fit a lot more into your day trip. With visits to such sights as the Hiroshima Peace Memorial Park and the beautiful Miyajima Island often combined, it is a moving and evocative experience hearing your guide’s commentary on the tragic events that took place here. See trip reviews & prices. Like Kyoto, Nara was once the capital of Japan. It is a scenic town that contains a large number of cultural and historic sites, including the Daibutsu (Great Buddha), which can be found in Todaiji Temple. This large bronze statue is one of Japan’s most famous landmarks. The city is also famous for the extremely tame and friendly deer that live in Nara Park. You’ll also find a slew of temples and shrines in Nara, including its best known, Kasuga Taisha, which is famous for its many stone and bronze lanterns. Nara is also famous for its Mount Wakakusa Fire Festival, which occurs on the fourth Saturday in January. 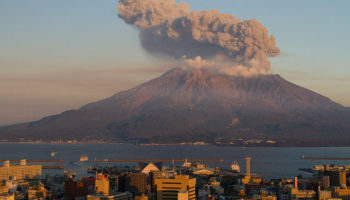 On that day, the grass on Mount Wakakusayama is set on fire in a spectacular blaze of glory. 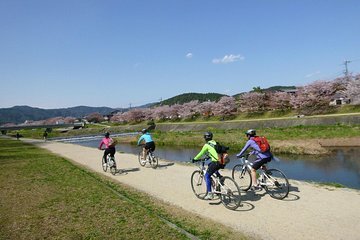 Lying just 35 kilometers to the south of Kyoto, it is easy to reach Nara, and travelers have a number of public transport options available to them. On the JR Nara Line, it only takes 45 minutes by express train, and this will take you directly from Kyoto Station to Nara Station. The other option is to take the private Kintetsu line from Kintetsu Kyoto Station; this takes 35 minutes if you take the express train. While the latter option is more expensive, it is also comfier and quicker, which leaves you more time to see Nara’s sights – all of which are within walking distance once you arrive. 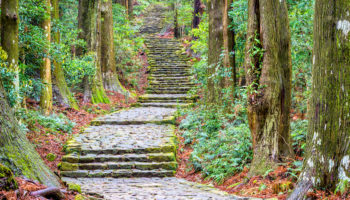 To make the most of their time in the city, many people opt to take a guided tour, as this means you can see Todaiji Temple, the Deer Park, and Kasuga Shrine without having to navigate your way around Nara. With a professional guide on hand, you’ll also come away with a greater understanding and appreciation for the former capital and its rich history. See trip reviews & prices.